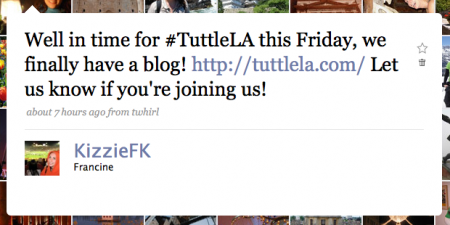 Today, we finally launched the Tuttle LA blog. It was meant to be a super easy and quick installation, but took longer than expected, mostly due to technical problems with the host we were going to use. I kept it nice and simple, but added some neat plugins that I hadn’t used before, including Event Calendar, so you can see our upcoming meetings, and Twitter Tracker, which I wish had a few more top-level options, but is a nice way to pull a Twitter search into your sidebar and is easy to style. 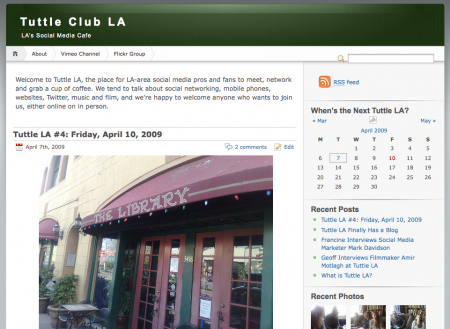 With the launch of the blog, we also announced our next meeting, this Friday, April 10, 2009, at The Library Coffee House in Long Beach. We’re meeting at 10:30 a.m. again, and anyone who’d like to come is welcome. Hope to see you there!